Saturated fatty acids have no carbon-carbon double bonds (they are “saturated” in the sense of containing as much hydrogen as possible). 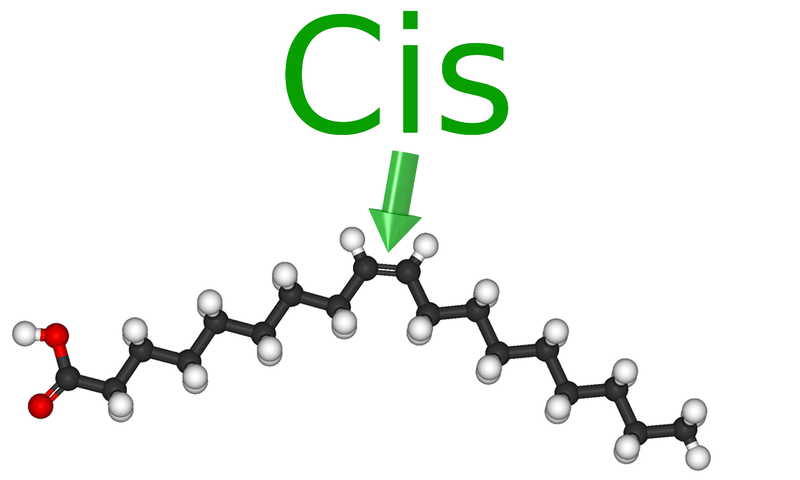 Fats made from saturated fatty acids (“saturated fats”) tend to be solid at room temperature, because the straight-line molecules stick to each other. Saturated fats are usually of animal origin (although coconut oil and palm oil are also mostly saturated). 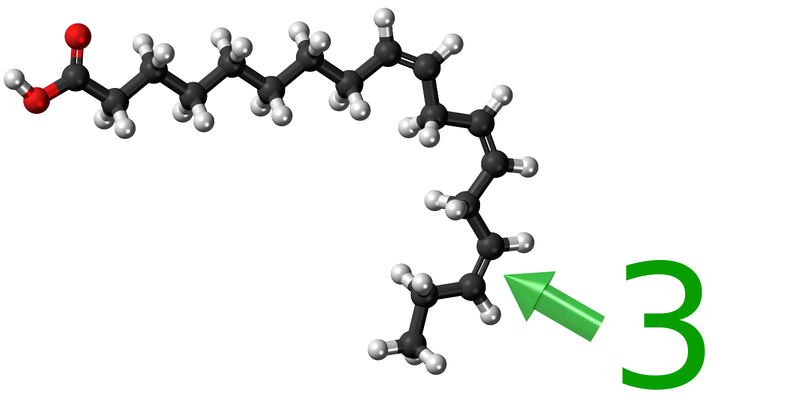 Monounsaturated fatty acids have exactly one carbon-carbon double bond per molecule. Oleic acid (in e.g. olive oil) is an example. 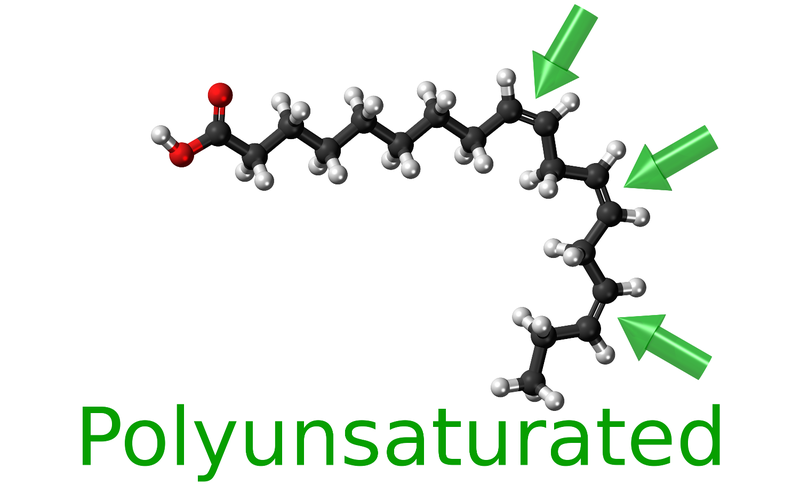 Polyunsaturated fatty acids have two or more carbon-carbon double bonds per molecule. Linoleic acid (in e.g. sunflower oil) is an example. Fatty acids can also be classified in dietary terms. The body needs fatty acids, but can manufacture most of them itself. Essential fatty acids are fatty acids that must be included in the diet. Both ALA and linoleic acid (found in vegetable oils) are essential. 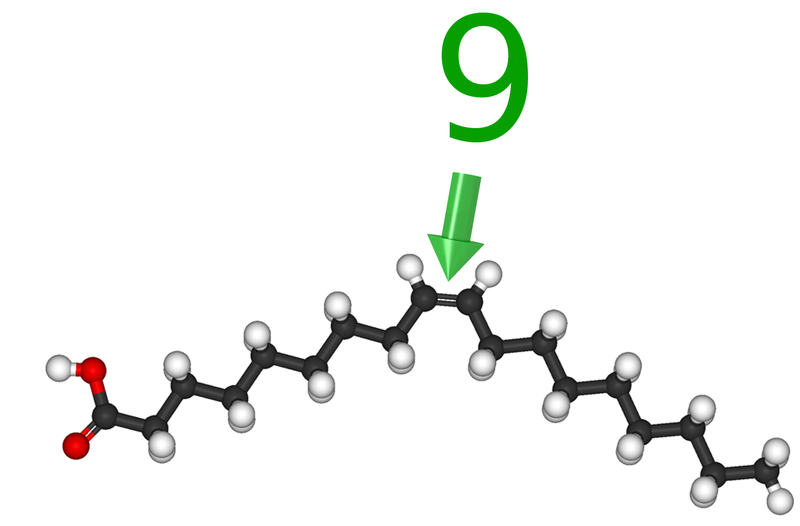 Adult men need about 13 grams of linoleic acid and 1.3 grams of ALA per day. Some omega-3 fatty acids from oily fish should also be included in the diet. Fish oil capsules contain the omega-3 fatty acids EPA and DHA. In contrast, trans fats are particularly unhealthy, and should be eliminated from the diet completely. This can be difficult in the USA, since pre-packaged foods there often contain trans fats (because of their long shelf life). 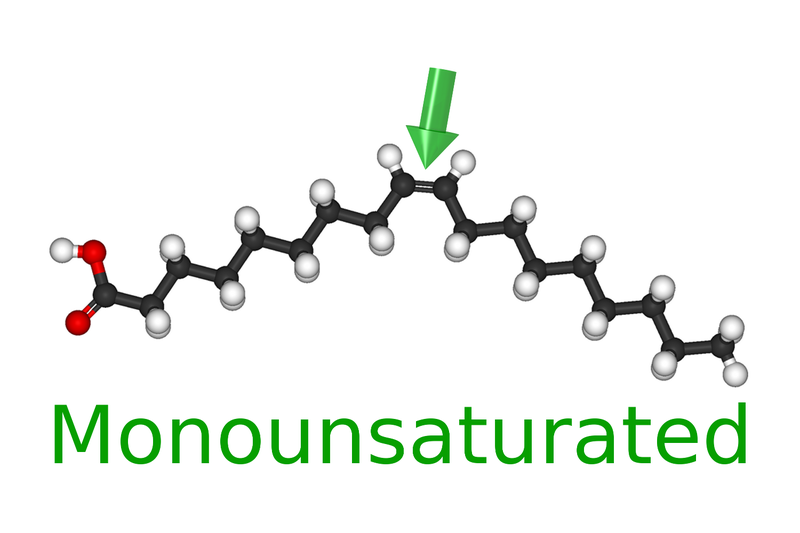 Monounsaturated and polyunsaturated oils are also preferable to solid saturated fats. Butter contains a large amount of saturated fat. A new moth, Sympistis forbesi, was reported earlier this year by Brigette Zacharczenko, David Wagner, and Mary Jane Hatfield (thanks also to them for the photos above). The moth feeds on horse gentian plants in the woodlands of eastern North America. Reports like this are a reminder of the unexplored species diversity that exists, not only in distant and exotic locations, but in our own back yards. In the previous NetLogo tutorial, I discussed running R inside NetLogo. In this post, we discuss the RNetLogo package for running NetLogo inside R (see also this article). We use a NetLogo implementation of Conway’s “Game of Life” similar to that in the previous NetLogo tutorial. Since we can inspect the “inside” of the NetLogo model, and apply all the analytical power of R, many statistical tests can be performed, and many plots drawn. 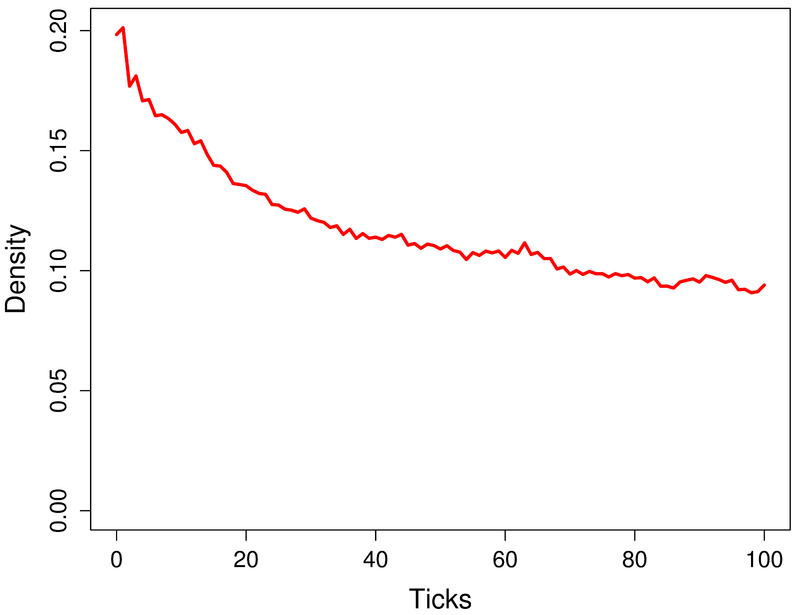 Plotting the calls to run.life shows how the final average density varies with the initial state. 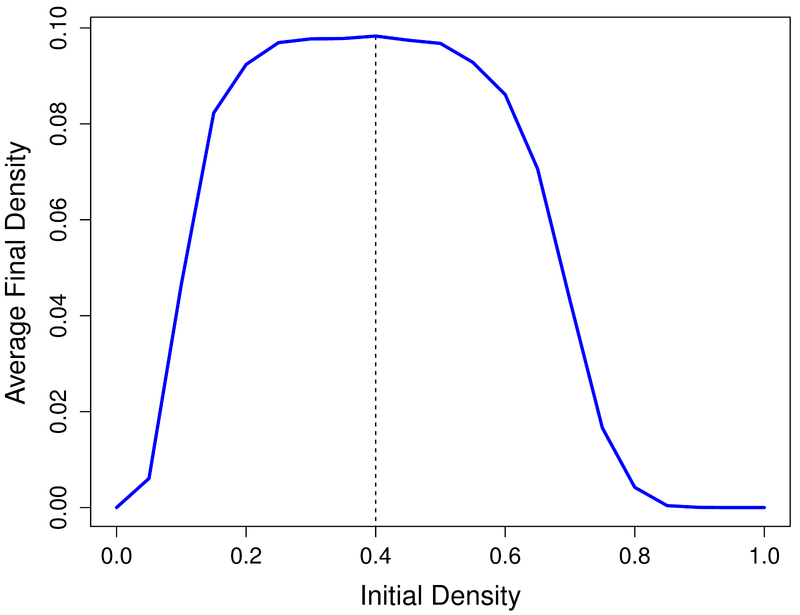 For example, an initial density of around 0.4 gives the highest average final density. With multiple parameters, it may be best to use R’s optimisation capabilities to find the best parameter values. The parallel-execution features of R are also potentially useful. The Solar Dynamics Observatory has taken this wonderful video of the activity going on at the hellishly hot surface of the sun – showing coronal loops, in particular. See also these other SDO videos. The debate last February between creationist Ken Ham and science educator Bill Nye has been widely discussed (see also the video). Both sides were rather an embarrassment, but one interesting aspect was Ham’s distinction between “observational science” and “historical science.” This has been called an “inane and baseless fallacy” – but is it? In fact, all watchers of the CSI franchise know that there is a clear distinction between (on the one hand) applying known science to the past – in order to decide who did what – and (on the other hand) developing new knowledge of scientific principles. There is, of course, an interplay between the two. For example, forensic entomology draws on experimental work in a specific aspect of insect ecology. Experimental work in ballistics (popularised by the MythBusters) is used to decide what conclusions can be drawn from bullets and bullet wounds. Observational science tends to be restricted to the here-and-now, where confounding factors can be dealt with. NASA and ESA justifiably spend a lot of money sending probes around the solar system (e.g. the probe above) so that the reach of observational science can be extended to objects which humans cannot visit. Events which are outside the solar system, or are distant in time, are outside the scope of direct observation altogether, which means that some degree of inference is inevitable. Of course, this does not mean that scientists throw up their hands in despair, and say “we’ll never know.” Astronomers routinely investigate the same phenomenon at multiple wavelengths (e.g. radio waves and visible light), in order to get a clearer picture of what’s been going on. The supernova of last April (see image below) is one example, having been investigated at gamma-ray and optical wavelengths. 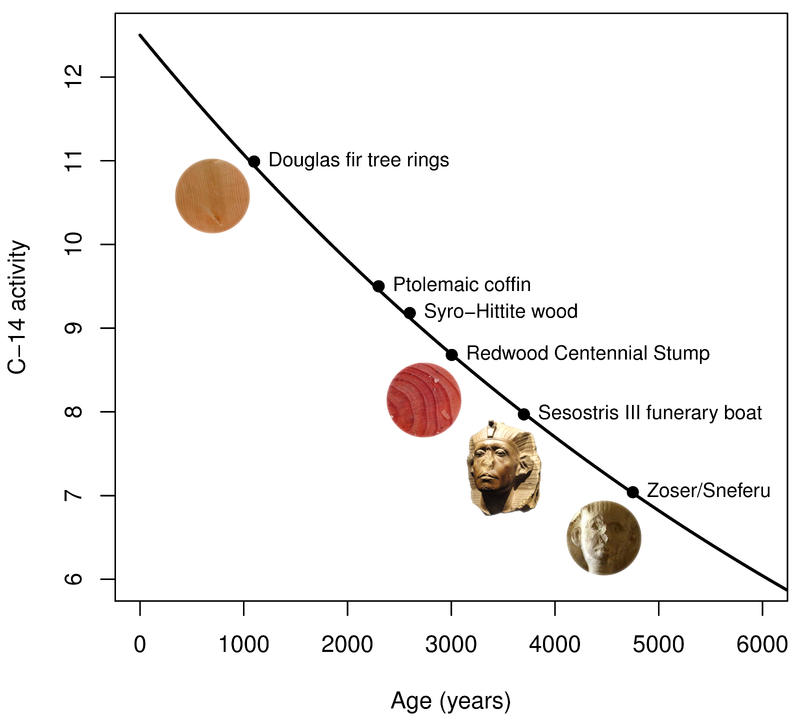 Carbon dating involves several assumptions about the past – but from the very beginning those assumptions were cross-checked using other dating techniques, such as tree rings and historical methods (the diagram below is redrawn from the Arnold & Libby paper of 1949). In practice, carbon dating is adjusted for multiple confounding factors, and provides a moderately accurate dating method for carbon-containing objects with ages up to tens of thousands of years. In summary, then, a distinction can indeed be drawn between “observational science” and “historical science.” The latter draws on the scientific principles established by the former. Scientists tackle the problem of not being able to directly observe the past by using multiple independent methods to infer what happened, and this can allow very solid conclusions to be drawn. That’s precisely what makes books, films, and television shows about forensic science so compelling. Update: see also this 2008 post from the National Center for Science Education on the topic. The NASA Orbital Debris Program Office has long worked on monitoring and managing the serious problem of space debris. Now, a new Australian Collaborative Research Centre (CRC) for Space Environment Management based at Mt Stromlo Observatory will add to this effort. It will bring together the expertise of two Australian universities and two companies, together with US and Japanese partners. The photo below of the Satellite Laser Ranging (SLR) facility at Mt Stromlo is by Ian Sutton. It’s Pi Day again today (3/14 as a US-style date). The piday.org website has more information. Happy π day!